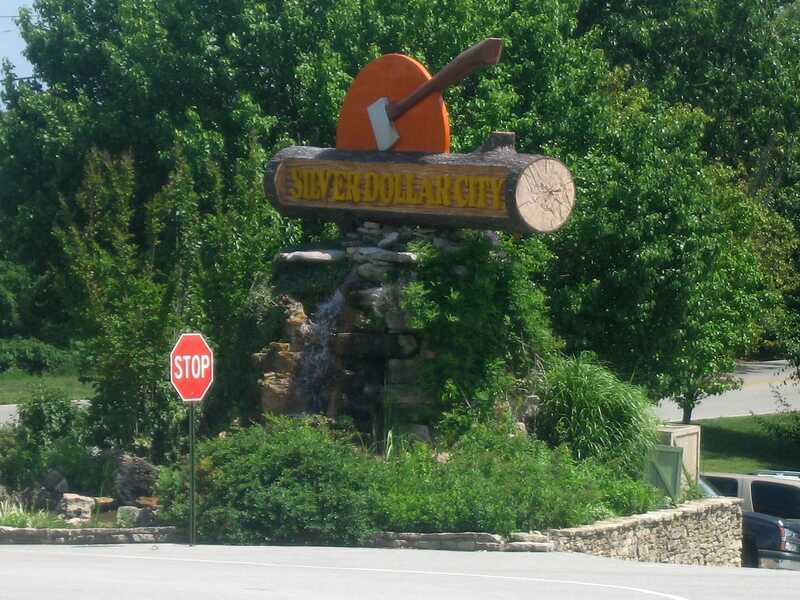 There is one phrase that is an absolute pre-requisite for any trip report covering Silver Dollar City, a large park in Branson, Missouri. The local demographic can be best summarised by the clear signs in front of the park which warn patrons that firearms are not permitted within. The continuous bluegrass music, interrupted only occasionally by the hymn singalong sessions (!) only serve to reinforce the inevitable. It must be said, but only once: yee-haw! The first thing one notices on arrival at the park is the sheer number of visitors. We ended up with a parking space in a lot that was more than ten minutes walk from the front gate, all of which is through additional parking. This being America, a shuttle bus arrived to spare guests the unnecessary physical exercise, nevertheless taking two minutes to cover the distance at normal driving speeds. My ability to estimate is very poor, so I don't intend to guesstimate a number of spaces, but suffice it to say that the car park was the largest I have seen in any park not owned by Disney. Even during our visit, on a Friday in June, the park was very crowded, though it became clear that a large percentage of the guests were there for the shows and atmosphere instead of rides. This was extremely fortunate from our perspective, as the queues could easily have been many times worse than they were. The park is graced with some of the best roller coasters in any park I have been to, and I do not use those words lightly. The three major coasters are all top twenty rides, and the themed indoor coaster scored major points for its scenery, if not the ride experience itself. The first one we got to was Thunderation (#747), an Arrow mine train that takes advantage of the terrain to have the (only) lift hill at the end of the ride. This careful positioning means that the train and ancillary sound effects are for the most part inaudible from outside the ride area, of particular benefit given the type of park. Two of the ride cars face backwards, providing another unusual twist. Though more than a decade old, it tracks like a brand new ride, a testament to the skill of the park maintenance department. In all fairness, Silver Dollar City is in Missouri, so it is possible that the occasional patron may not be able to read. Nevertheless, for everyone else, there is a large notice at the entrance to the queue that enumerates those very same ride rules, and for everyone else - if, in fact, it was necessary to repeat these rules - surely this could be done while someone else was operating the ride? This would double throughput at least! Fifteen minutes of walking brought us to another extreme, being the superb B&M sit down, Wildfire (#749). From watching the operation one could easily believe that this was a completely different park; a highly efficient crew were keeping two trains on course with no stacking whatsoever, despite a non-existent queue, giving a capacity in excess of one thousand per hour. There's a certain element of same-ness about different sit down B&M rides, though that is by no means a bad thing; the coaster as a whole was highly enjoyable, boosted by what is one of the best first drops on any coaster anywhere, especially in the back seat. The other adult coaster, Powder Keg, went down with technical difficulties just as we approached, with guests pouring out of the queue entrance. Rather than wait for it ("we do not know how long it will be") we decided to head over to Fire in the Hole (#750), a dark ride with three decent size coaster drops and a completely drenching water splash at the end. For those who have been to Dollywood, the ride is almost identical to Blazing Fury, though I don't remember getting quite so wet there. Flawless timing meant we arrived back at Powder Keg (#751) just as the ride reopened. The net result was an appallingly long wait of zero minutes and zero seconds for a back row, which turned out to be well worth it. The ride is in many ways an eclectic mixup, featuring a diagonal lift mechanism from out of the station, an air launch, a lift hill mid ride, and two different track designs. This is all, however, irrelevant; the short version is that S&S have got a real winner with this ride. Though it is billed as a family launched coaster, it is nevertheless exciting enough that enthusiasts could sit on it all afternoon. They could, that is, if the capacity was a little better. Our timing was good insofar as we had rejoined the queue for a second go before too many people had spotted the ride had reopened, so we only had to wait about fifteen minutes for our second go. RCDB says that the ride has three trains, but only one was on track, which resulted in a serious queue. By the time we had disembarked for the second time the line length had to have been more than two hours, making additional riding impossible. There was no obvious sign of the other two trains; perhaps they were being reworked before the high season starts. Celebration City is owned by the same company as Silver Dollar City, but the outside observer would be hard pressed to realise that. 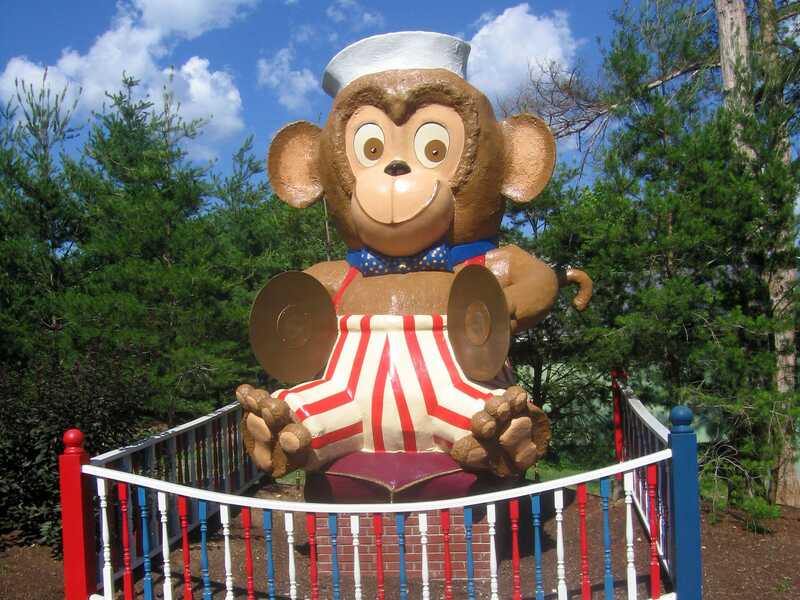 Whereas the first park was positively gigantic, with theming elements everywhere, Celebration City is the other extreme; a small unthemed park with a selection of amusement rides, with a giant monkey as a mascot. Two or three hours is ample to see everything, and this is acknowledged by the admission price, less than half that of its brother. This should not be construed as a criticism by any means; rather, it is intended to give the reader an idea of how much time to allow in trip planning; a few hours would be ample here. In my diary on Monday, I remarked that Miler Coaster Inc was never supposed to build a ride over thirty feet tall. Jack Rabbit (#752) is a further proof of this postulate, as if it were needed. The design is that of a wild mouse, with the emphasis on the word wild. Unfortunately, a layout like this only works if the wheel mechanisms on the train are spring loaded and fitted closely to the track which, er, wasn't the case here. The usual analogy is of a shopping trolley over cobblestones, but this is unfair to the average shopping trolley. Instead, consider the cars as bowling balls, and the corners as concrete barriers. Once was without question enough. The same was true for the most part of the Thunderbolt (#753), although in this case the concrete barriers were at least heavily padded. 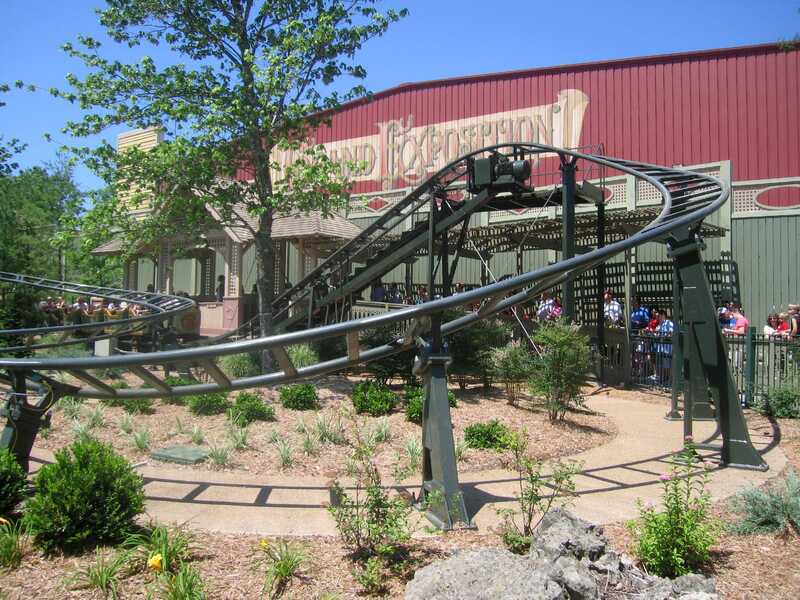 Fortunately, the park as a whole was rescued by the presence of a high caliber wooden coaster, the Ozark Wildcat (#754). The layout of the ride, particularly the start, had many things in common with the Kentucky Rumbler. The ride was also operating with that most pleasant of rules; you may ride again if nobody is waiting for your seat; why can't more parks do this? You end up with happier customers, and there really are no down sides. We finished up our time in the park with a ride on the Ferris Wheel, which provided what is probably the best photo angle for a mid sized wooden coaster short of a light aircraft.